Spot vehicle issues before buying a used car. Reveal vehicle history at no cost by entering the license plate number on the Montana free license plate lookup. The Motor Vehicle Division of Montana DOJ can be requested for vehicle records. For inquiries, read the FAQs or contact either number at (406) 444-3933 for the Motor Vehicle Division or (406) 444-3661 for the Vehicle Services Bureau. Other means of contacting the agency can be found on the Contact MVD page. Owners must register and title their vehicles within 60 days of becoming residents. In order to register their vehicles, non-resident employees must provide their current vehicle registration from other states. Vehicle registration can be processed at any county treasurer’s office. Montana has a standard serial format containing five numerical digits and two letters. This serial format can be found on plates of passenger vehicles. Montana requires two license plates for each vehicle: the front and the rear plates. Submit a duplicate/replacement order for lost/damaged plates by filling out the application form. There are (16) license plate types that you can choose from in the state of Montana. Choose your desired plate type and read its description for requirements. Personalized plates can also be requested using this form. Each request costs $25.75, plus other associated fees. A single plate renewal/transfer request costs $10.30. In most situations, a license plate can be transferred to another vehicle registered under the owner’s name. Begin your title application at a Montana county treasurer’s office near your place of residence. For vehicles that were titled previously outside Montana, their out-of-state titles must be presented by the applicants. If it is unavailable, the state’s registration receipt may be offered as an alternative. Sorting out the paperwork of privately sold cars requires more effort from the owners, unlike dealership cars which are being serviced by a staff. As you apply for titling, an authorized agent may ask you to clarify some details by filling out a Statement of Fact form. Ready your payments for the fees and make sure all the information you will give are correct. Otherwise, the agency may declare your request invalid if the details given were proven wrong. The state mandates all vehicles to contain copies of registration receipt and insurance as defined by the state law. Request a replacement for your lost or damaged title by completing a copy of Form MV7. If you have no time to apply at an authorized office, you may submit your application and payment by mail. Get a bonded title if you have acquired a titleless vehicle by presenting copies of Form MV20 and Form MV10. You must detail all the relevant facts about your ownership. If a vehicle has a lien, you may ask for its removal by completing the release form with the lienholder. Visit the Vehicle Title and Registration page for other title-related content. Buying a used car in Montana? Don’t make a costly mistake. 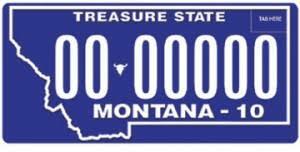 Run a Free License Plate Lookup for your Montana-registered vehicle! Run a Free Montana License Plate Lookup to uncover the full-story of your Montana-registered vehicle.